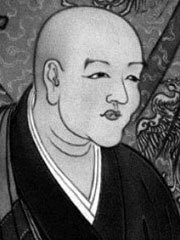 Dogen came from a noble family and he quickly learned the meaning of the word «mujo» (impermanence). His parents died when he was still young, and it is said that this early glimpse of impermanence inspired him to become a monk. He went first to Mt. Hiei, which was the headquarters of the Tendai school of Buddhism. At a young age, he raised the question: «Both the esoteric and exoteric doctrines of the Buddha teach that enlightenment is inherent in all beings from the outset. If this is so, why do all the Buddhas, past, present, and future, seek enlightenment?» This doubt led him to study Buddhism under the Rinzai teachers Eisai (1141 — 1215) and Myozen for nine years. Continuing his quest for the truth, he made the risky ocean passage to China, accompanying his teacher, Myozen, at the age of 24. After visiting several monasteries he came to study with Ju-tsing (J. Nyojo), the 13th Patriarch of the Ts’ao-t’ung lineage of Zen Buddhism in Mt. Tien-tung (J. Tendo). The lineage became known by its Japanese pronunciation, Soto, in Japanese. Two years later, he realized liberation of body and mind. Dogen came back to Japan after four years abroad. In 1244 he established Eiheiji in Echizen, now Fukui, to spread his approach to Buddhism. The temple remains one of the two head temples of the Soto sect today. He spent the remaining ten years of his life teaching and writing there. Dogen’s masterpiece is the Kana Shobogenzo, lit. «Treasury of the True Dharma Eye», a collection of sermons on the Buddhadharma in 95 fascicles on topics ranging from monastic practices to the philosophy of language, being, and time. He emphasized the absolute primacy of zazen, or sitting meditation, and the inseparability of practice and enlightenment. His most notable successor was Keizan (1268 — 1325); together Dogen and Keizan are regarded as the founders of the Soto school. To be enlightened by all things is to remove the barriers between one’s self and others. Dogen, Trans. Norman Waddell and Masao Abe; ; SUNY Press, Albany; ISBN 0-7914-5242-5 (1st Edition, hardback, 2002). Steven Heine; ; SUNY Press, Albany; ISBN 0-7914-1773-5 (1st edition, hardback, 1994). William R. LaFleur, Ed. ; ; The Kuroda Institute; ISBN 0-8248-1011-2 (Hardback, 1985).